Scooper - Technology News: How can Brazil reboot its economy? How can Brazil reboot its economy? Brazil should have so many reasons to celebrate. As the B in BRICS, it has long been a model of what an emerging economy can achieve, and 2016 was a landmark year as the country hosted South America’s first Olympic Games. But there is very little party atmosphere. Months of political turmoil eventually saw Michel Temer sworn in as president in August 2016 after senators voted to remove Dilma Rousseff from office over financial irregularities. Temer’s inauguration brought to an end the 13-year rule of the left-wing Workers' Party. The new leader pledged to bring back "political stability" to the recession-stricken country and said , “My only interest is in handing over to my successor a country that is reconciled, pacified and growing economically." What’s the problem with the economy? Brazil’s deep 2015‑16 recession was the country’s worst economic crisis since the Great Depression. And it intensified unexpectedly in the final quarter of 2016, according to recent data from statistics agency IBGE. GDP contracted by 0.8% in July-September 2016 on a seasonally adjusted, quarter-on-quarter basis (and by 2.9% in year-on-year terms). In October, industrial output declined by 1.1% month on month. The view among most economists is that Brazil will emerge from recession in 2017, but slowly. The government has forecast growth of 1%. In November 2016, Brazil's government lowered its forecast for economic growth in 2017 to 1.0% from 1.6%. Finance Minister Fabio Kanczuk said he expected the economy to return to growth in the first quarter of this year. In addition, the government said it expected the economy to have contracted by 3.5% by the end of 2016, compared to an earlier forecast of 2.5%. 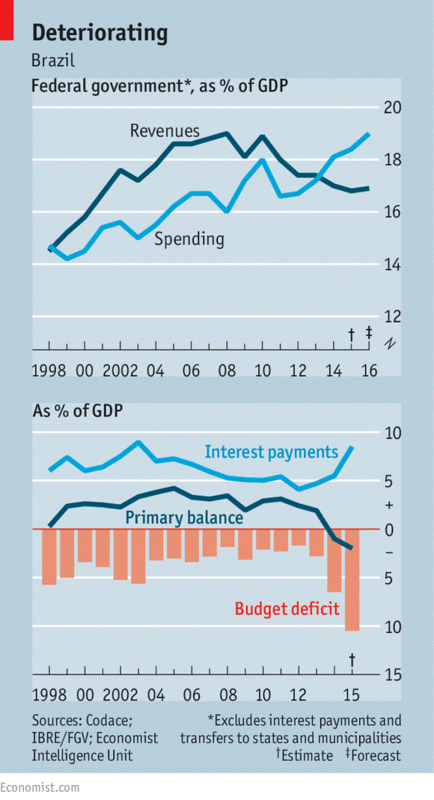 At close to 70% of GDP , public debt is large for a middle-income country and rising fast. Because of high interest rates, the cost of servicing it is around 7% of GDP. Is this unique to Brazil? Brazil has been hit especially badly by sharp falls in the price of oil and other commodities. The drawn-out political crisis in the country also shook investor confidence. Last year Moody’s became the last of the three big credit-rating agencies to downgrade Brazil’s debt to junk status. Among 41 countries whose performance was measured by the OECD , Brazil’s manufacturing productivity is the fourth lowest. The country ranks 81st in the World Economic Forum’s Global Competitiveness Index 2016-2017 . What’s the country doing about it? President Temer wants to pass reform to slash pension benefits, which represent nearly half of the country's expenditures before debt-servicing costs. He is expected to have to rely on rate cuts as the fiscal crisis limits his ability to provide other stimulus. And the central bank surprised markets this week with a larger-than-expected rate cut. In a unanimous vote, the central bank's nine-member monetary policy committee decided to cut its benchmark rate by 75 basis points to 13% after two straight cuts of 25 basis-points. The president said the drop in rates showed the conditions for a recovery were now in place.